EXPERIENCE THE ULTIMATE SKI LIFT! 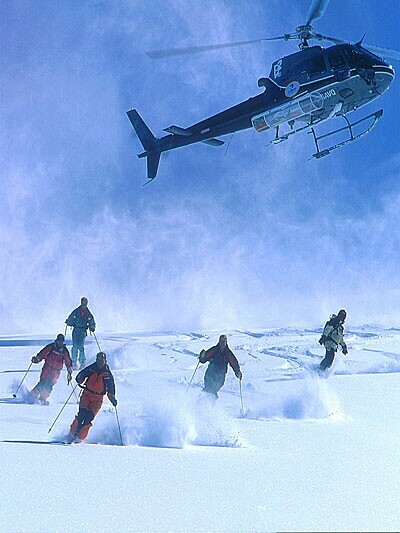 18 years of experience at many different helicopter ski areas in Canada has given us a good idea about the wide range of companies for you to choose from. Some companies may be better for you than others. Do you prefer glacier skiing or tree skiing? Do you want to see and be seen amongst the "in" crowd or would you rather hide in some cozy lodge far away from the hussle and bussle of business life? Have you done helicopter skiing before or is this your first time? How experienced are you at skiing powder? Do you have a group of 10, 3, 4, friends who would like to be together in one helicopter? Would you like to try only for a day or go for a whole week? Tell us what type of skier you are, what you like and don't like and we will match you up with the best destination for you. 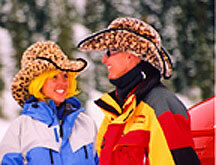 If you can ski the Blue (intermediate) runs at your ski area, then you can heli-ski with Whistler Heli-Skiing. 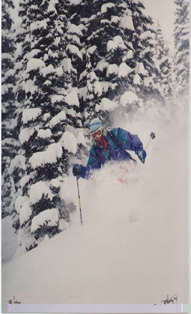 Whistler Heli-Skiing has been providing great powder experiences since 1983. Just beyond the ski lifts of Whistler/Blackcomb, minutes from North America's #1-ranked Whistler Resort, awaits the ultimate high-alpine experience. Imagine carving through untracked powder, endless terrain and breath-taking scenery. With hundreds of ski runs, there is a tremendous variety of slopes to accommodate all levels of skiers and boarders from intermediate to expert. The runs vary from wide-open glaciers to beautiful gladed tree runs. The heli-ski area is made up of several zones. Your guide will select terrain within a zone according to snowfall, the weather, and your group's ability. There are 1.5 million acres of terrain to choose from. It is a great way to experience Heliskiing for the first time - come and ski for a day - or ski the whole week. Groups of 10 - 11 heliskiers in Bell 212's or groups of 5 in Bell 407's or groups of 4 in A-Stars are your choice. Think about the perfect ski trip. Good friends, great powder, limitless terrain. Follow this with a whirlpool or steambath, then a massage followed by a gourmet meal prepared by a string of famous Swiss trained chefs. All this and more awaits you in Blue River, B.C. - Deep Powder Country. The Carioboo and Monashee mountains define this 3,000 square mile area and offers an incredible array of terrain options. Endless glacier runs of more than 5,000 vertical feet give way to widely spaced tree runs - possibly the best tree skiing in the world! The highest peak, Mt. 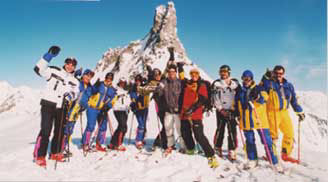 Albreda, is 11,600 vertical feet high with the longest skiable vertical of 6,000 feet. Blue River lies approximately 2.5 hours by bus on Highway # 5, North of Kamloops Airport in the Interior of British Columbia. Flights arrive daily in Kamloops from Calgary or Vancouver.